I was talking to a friend of mine the other day that just recently started working out. He picked up a few pieces of equipment from a local department store and was looking for some friendly advice on how to get started. My first question was why he decided to start working out. The answer shocked me. He said that he was going to join a gym but needed to get into shape beforehand. For complete openness, I do work in a commercial fitness club. But I don’t recall anyone needing to be in shape to join. Quite the opposite, many people of different fitness levels join fitness centers every day. I am in favor of people choosing to work out at home and not joining a gym. I worked out from home for years and both working out from home and in a commercial club have their pros and cons. But naturally I wanted to know why my friend said that. He explained that everyone in the gym will be in shape and he didn’t want to embarrass himself. That was that. He was under the impression that everyone in the gym knows what they are doing and are super fit. First of all many people embarrass themselves in gyms every day and not for being out of shape, they get embarrassed because they do something stupid. The stigma around not knowing what to do in a gym can be intimidating for some. The idea that there is going to be a lot of fit people in the gym and you are going to stick out like a sore thumb can also cause a little stress when it comes to getting a membership. 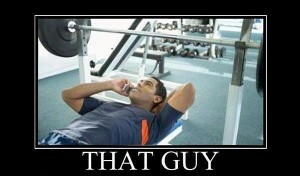 Let me be the first to say that not everyone in the gym knows what they are doing. Even many of the guys and girls that are big and in shape that look like they know what they are doing are doing things incorrectly. So don’t copy exercises that someone else is doing unless you get specific instruction from a qualified professional. And being big and in shape is not a qualification. A good rant about certifications in the fitness industry will be coming shortly. Many people that start at a gym start with some sort of (hopefully certified) personal trainer. Usually a good idea, they can get you started with some basic exercises. The big thing to note; if you are not in shape or that familiar with gym equipment, and you don’t want to get noticed, you won’t. The people in the gym that want to get noticed will get noticed. They are overly loud, dress inappropriately or strangely, talk to a lot of people and spend a lot more time trying to get noticed than working out. The average gym goer, wearing normal gym close walking on a treadmill or doing some resistance training machines typically don’t draw a large crowd of onlookers. If you want to work out at your house, by all means go ahead. There are lots of pros and cons of both gyms and working out at home. If you do join a club seek some advice on how to get started if you are unfamiliar with gym equipment. And above all don’t worry about drawing attention to yourself in the gym, most people are looking at someone else. ← Is picking up the mail that hard? Thanks for the reply. I have been in the industry for a while and want to share as much knowledge as I can with others. I completely agree. I hope the advice helps people get over some of the fear they may have when starting a fitness program. you can contact me at robdickson.net. That portion of the site should be up soon. You can subscribe over at the side. I send out the latest blog when it is posted to all my subscribers.